With the past few months serving as a stark reminder that you can never count on what the weather will do in this country, some gardeners are wondering how gardening will fit into a future of radically changing weather. In a new initiative the Woodland Team at RHS Wisley are building a garden walk designed to exemplify “gardening in a changing climate”. So what will the British garden of the future look like? According to Head of Science Dr Alistair Griffiths it will take the form of the hardy plants and brush of the Mediterranean. The new walk at Wisely stretches for about 150m and includes examples of “Mediterranean” planting from across the world. Regions such as Australia, Chile, California and South Africa are on display as well as plants from around the Mediterranean itself. 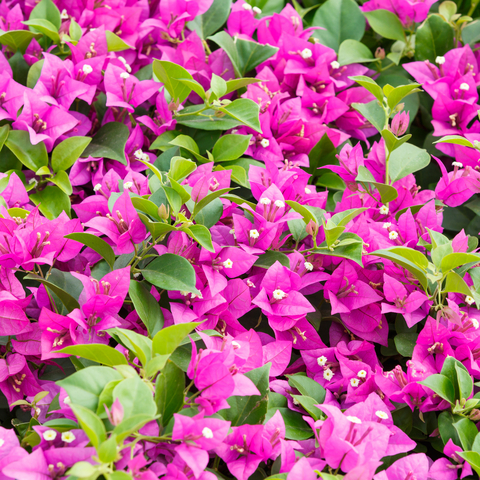 Could Bougainvillea spectabilis be as common in the UK as it is in Southern Europe? So does this mean we can look forward to a Mediterranean climate in the future? Well, no. The reason for the focus on Mediterranean plants is not for their love of sun and dry conditions but for their innate hardiness. As anyone from the various parts of the world on display here will tell you; the climate of their regions is not a constant balminess. Australia is known for both torrential rain and the occasional forest fire, South Africa can be gripped with drought and dust storms one moment and flash flooding the next and depending on where in Chile a plant may find itself, it will have to deal with everything from tropical storms to snow. The key feature under scrutiny here is of course the plants’ ability to remain hardy not just through rain, sleet, snow or scorching drought but through all of them. By showcasing these super plants, the team hope to inspire future gardeners to build a garden that can survive quite happily even in the changeable climate predicted by many as not too far away at all. The Mediterranean walk is currently under construction in the hardy plants section of Wisely and is offering tours of site as it is developed. More information is available on the RHS website.